No dog should have to go through what Gordo did to find a loving home. But when a story like this has a happy ending, we all cheer for the saved life and for the people who stepped up to make things right. Gordo had a lot of people pulling for him, and as a result he received the care that he needed and the home that he deserves. Gordo was badly abused by his owner when he was only 4 months old. As reported by the Los Angeles County Animal Care Foundation (ACF), his previous owner, while under the influence of drugs, allegedly threw Gordo against a wall and repeatedly kicked him. 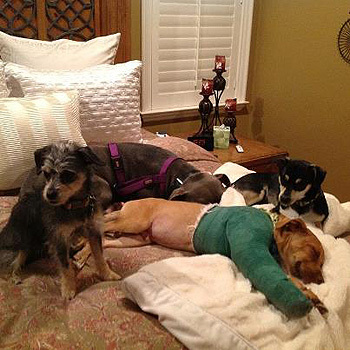 Gordo suffered serious injuries and required surgery to repair a fractured elbow. Initially Gordo was brought to the Los Angeles County Department of Animal Care and Control (DACC) in Baldwin Park for treatment. According to Evelina Villa, spokesperson for DACC, his injuries were too extensive to be repaired within the routine resources of shelter medicine, so the ACF stepped in. The ACF sponsors the “Dreams Come True” fund. This fund exists to help animals like Gordo, who come to the Los Angeles animal care centers with extraordinary needs. It helps cover the costs of special surgeries and procedures. 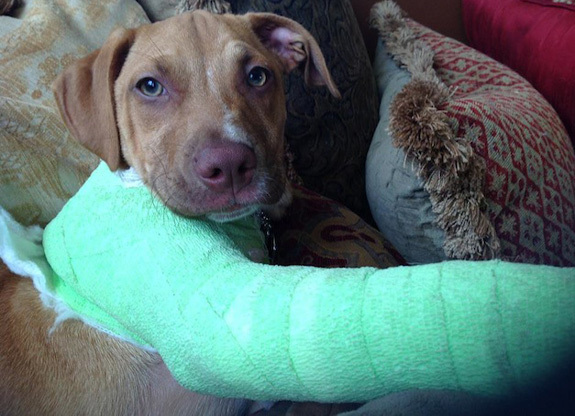 Following Gordo’s surgery he spent some time in foster care to follow up on his recovery. This placement was an extension of the wonderful care he received from the Westminster Veterinary Group, where he garnered many fans. He had a very dedicated and loving foster caregiver, who did an amazing job of making sure he got the critical care that would lead to adoption. Less than two months after Gordo arrived at the Baldwin Park Animal Care Center (DACC) he got adopted. This courageous and beautiful boy had many “suitors,” so the home that he went to is a special one. 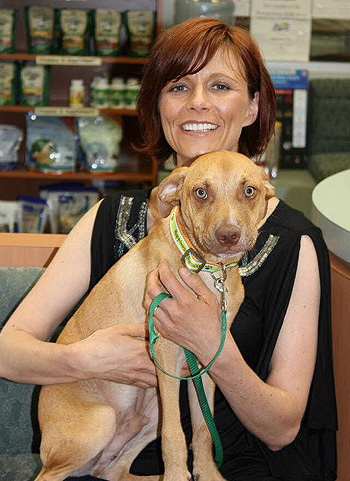 Gordo’s new life would not have been possible without all of the organizations and supporters who came to this little dog’s rescue in his time of greatest need. Credit also goes to everyone involved in getting this story out to the public. It’s gratifying to know that support is there for dogs like Gordo. And now one more dog has the life that he was meant to live. And as if that weren’t enough, he’s been promised a new name. Given his slender physique, that sounds like a good idea. Legislators and nay sayers need to read Gordo’s story and many others who share a similar stories. These dogs are awesome in their own right as well as other breeds. No person or living creature should be treated like this. If folks would deal with those that mistreat them instead of banning any dog we’ll have happier stories and fulfilled life. @theprettychic Amen! How can anyone look at the horrific abuse this poor little pibble endured and blame the dog?! I’ve said it before and I’ll say it again, we have a people problem, NOT a dog problem! 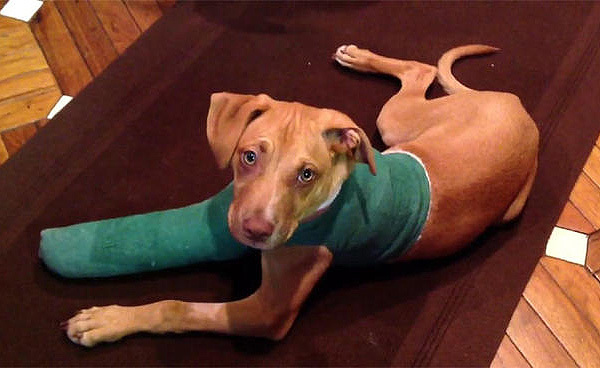 What a wonderful story — thank you so much for rescuing Gordo. It makes to sick to think of what happened to him, and to see pictures of him in that massive cast. Looking into this dog’s eyes I see an old soul. His abuser probably realized the dog had more going on inside than he did and didn’t like it. I hope the abuser was charged, but probably not (I am doing my best to be polite here!!). But Gordo prevailed and that’s the best revenge of all. 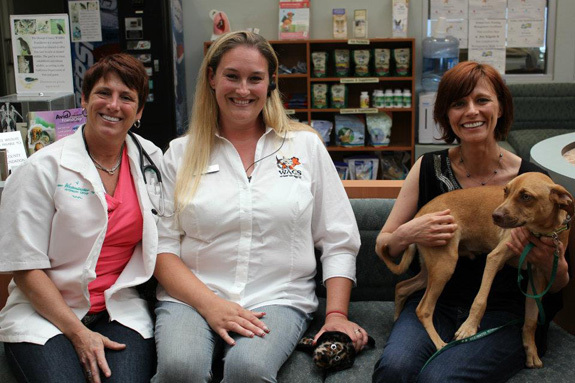 And bless the rescue orgs who do what they do to make this all happen. @DianaJones Gordo’s life filled with love is the best revenge. Thanks Diana. Yes, you’re right – it’s the rescue orgs that set right a terrible wrong. Gordo fortunately was removed from a teriible situation and will now live the good life. I know he will be paying back in so many ways, as they all do. A story like this highlights the compassion that is all the reason I need to keep going in the wake of abuse. This story highlights the good being done by people who refuse to quit when things get ugly. This is why I keep going. Hope is alive as long as people can come together like the heros in this story did for Gordo! @Matt.S So true Matt, it’s amazing how much we can all accomplish when we work together for the benefit of the dogs. There were a lot of heroes in this story. I believe that when you let people know that help is needed and provide the means to do that, there are enough good people out there who are willing to step up to the plate. Getting the word out saved Gordo. I was so gratified to learn of all of the donors that helped pay for his care, and the vet team that provided that care. He had a lot of guardian angels and it all started with the LA DACC who got his story out there. What a wonderful story! Thanks to everyone who helped this precious little life. Rock on Gordo! Yay Gordo!!! Kudos to the Teams of people saving dogs. One act of kindness…whether you “Share” a story, volunteer, foster, adopt, donate or care; you are making a significant difference in the life of so many dogs. Thank you Stubbydog for posting all these wonderful, inspirational stories.